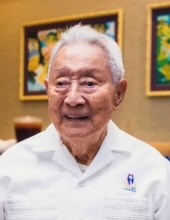 94, of Honolulu, passed away in Honolulu on Tuesday, March 26, 2019. He was born in Honolulu. He is survived by his loving wife, Nancy. Sons, Mark and Michael(Jenny), daughter, Ann Shimamura (Eugene). Grandchildren, Ross Shimamura (Sondra), Diana Hirabayashi (Shige), Ryan Nomura (Kathy), Kevin Shimamura (Aja) and Lauren Nomura (Racer). Visitation: 10:00 am on Sunday, April 14, 2019 at Nuuanu Memorial Park& Mortuary. Services: 11:00 am on Sunday, April 14 at Nuuanu Memorial Park& Mortuary. To send flowers or a remembrance gift to the family of Frank Masakatsu Nomura, please visit our Tribute Store. "Email Address" would like to share the life celebration of Frank Masakatsu Nomura. Click on the "link" to go to share a favorite memory or leave a condolence message for the family.